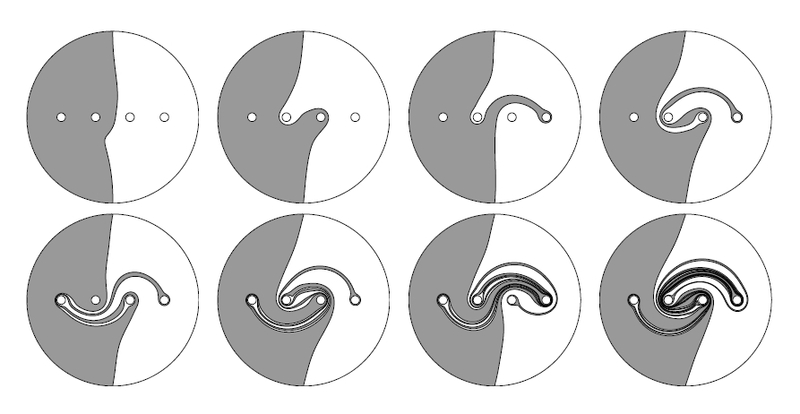 • Jean-Luc Thiffeault and Matthew D. Finn, Topology, braids, and mixing in fluids. I’ve talked a lot about entropy on this blog, but not much about topological entropy. This is a way to define the entropy of a continuous map from a compact topological space to itself. The idea is that a map that mixes things up a lot should have a lot of entropy. In particular, any map defining a ‘chaotic’ dynamical system should have positive entropy, while non-chaotic maps maps should have zero entropy. How can we make this precise? First, cover with finitely many open sets Then take any point in apply the map to it over and over, say times, and report which open set the point lands in each time. You can record this information in a string of symbols. How much information does this string have? The easiest way to define this is to simply count the total number of strings that can be produced this way by choosing different points initially. Then, take the logarithm of this number. Of course the answer depends on typically growing bigger as increases. So, divide it by and try to take the limit as Or, to be careful, take the lim sup: this could be infinite, but it’s always well-defined. This will tell us how much new information we get, on average, each time we apply the map and report which set our point lands in. Believe it or not, this is often finite! Even though the log of the number of symbol strings we get will be larger when we use a cover with lots of small sets, when we divide by and take the limit as this dependence often washes out. Any braid gives a bunch of maps from the disc to itself. So, we define the entropy of a braid to be the minimum—or more precisely, the infimum—of the topological entropies of these maps. How does a braid give a bunch of maps from the disc to itself? Imagine the disc as made of very flexible rubber. Grab it at some finite set of points and then move these points around in the pattern traced out by the braid. When you’re done you get a map from the disc to itself. The map you get is not unique, since the rubber is wiggly and you could have moved the points around in slightly different ways. So, you get a bunch of maps. I’m being sort of lazy in giving precise details here, since the idea seems so intuitively obvious. But that could be because I’ve spent a lot of time thinking about braids, the braid group, and their relation to maps from the disc to itself! As we keep move points around each other, we keep building up more complicated braids with 4 strands, and keep getting more complicated maps from the disc to itself. In fact, these maps are often chaotic! More precisely: they often have positive entropy. Each horizontal slice depicts a map from the disc (or square: this is topology!) to itself, but we only see their effect on a little rectangle drawn in black. Okay, now for the punchline! Puzzle 1. Which braid with 3 strands has the highest entropy per generator? What is its entropy per generator? I should explain: any braid with 3 strands can be written as a product of generators Here switches strands 1 and 2 moving the counterclockwise around each other, does the same for strands 2 and 3, and and do the same but moving the strands clockwise. Now for the answer to the puzzle! • D. D’Alessandro, M. Dahleh and I Mezíc, Control of mixing in fluid flow: A maximum entropy approach, IEEE Transactions on Automatic Control 44 (1999), 1852–1863. So, people call this braid the golden braid. But since you can use it to generate entropy forever, perhaps it should be called the eternal golden braid. • John Baez, This Week’s Finds in Mathematical Physics (Week 233). These matrices are shears, which is connected to how the braids and give maps from the disc to itself that shear points. If we take the golden braid and turn it into a matrix using this representation, we get a matrix for which the magnitude of its largest eigenvalue is the square of the golden ratio! So, the amount of stretching going on is ‘the golden ratio per generator’. the magnitude of the largest eigenvalue of the resulting product can never exceed the th power of the golden ratio? There’s also a strong connection between braid groups, certain quasiparticles in the plane called Fibonacci anyons, and the golden ratio. But I don’t see the relation between these things and topological entropy! So, there is a mystery here—at least for me. • Matthew D. Finn and Jean-Luc Thiffeault, Topological optimisation of rod-stirring devices, SIAM Review 53 (2011), 723—743. Abstract. There are many industrial situations where rods are used to stir a fluid, or where rods repeatedly stretch a material such as bread dough or taffy. The goal in these applications is to stretch either material lines (in a fluid) or the material itself (for dough or taffy) as rapidly as possible. The growth rate of material lines is conveniently given by the topological entropy of the rod motion. 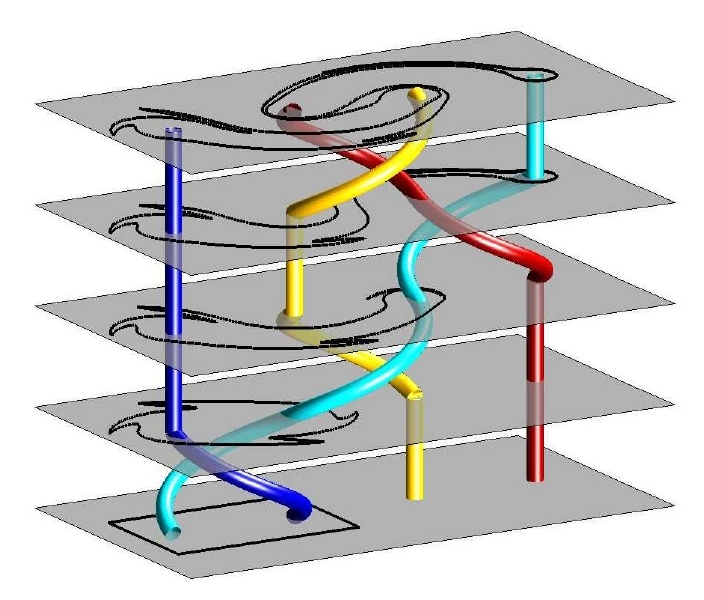 We discuss the problem of optimising such rod devices from a topological viewpoint. We express rod motions in terms of generators of the braid group, and assign a cost based on the minimum number of generators needed to write the braid. We show that for one cost function—the topological entropy per generator—the optimal growth rate is the logarithm of the golden ratio. For a more realistic cost function,involving the topological entropy per operation where rods are allowed to move together, the optimal growth rate is the logarithm of the silver ratio, We show how to construct devices that realise this optimal growth, which we call silver mixers. But now for some reason I feel it’s time to stop! This entry was posted on Wednesday, November 22nd, 2017 at 4:04 pm and is filed under information and entropy, mathematics. You can follow any responses to this entry through the RSS 2.0 feed. You can leave a response, or trackback from your own site. Non-specialist comment: Is there an application to energy-efficient mixing here? That is can we modify the gearing and mechanics of typical blenders to blend things more completely more quickly, thereby using less power….more “green”? I tend to think of this result as more about beautiful pure math than anything practical, but there are related papers that focus on the practical issue of efficient mixing. Since real-world mixing is about 3-dimensional fluids, it’s a lot more complicated. It’s very interesting, but I don’t know much about it. • Jean-Luc Thiffeault, A mathematical history of taffy pullers. Abstract. We describe a number of devices for pulling candy, called taffy pullers, that are related to pseudo-Anosov mapping classes. Though the mathematical connection has long been known for the two most common taffy puller designs, we unearth a rich variety of early designs from the patent literature. This paper has 56 pictures and is definitely worth a look! I never knew the mathematics of taffy was so interesting. I love the apparent real world usability of this! Don’t get me wrong, I also love pure maths (even if my understanding is very limited as this point), but it’s a rather surprising, unexpected use case, so that’s lovely in its own right. Also, watching that taffy puller is mesmerizing. Hence if we apply any sequence of matrices, repeated times, these two invariants are bounded by the th entry of a Fibonacci-like sequence. So they are bounded by a constant times the th power of the golden ratio. If the starting vector is an eigenvector, both invariants grow like the th power of the eigenvalue, so the eigenvalue is at most the th power of the golden ratio.